Technophiles should be quite familiar with the Everest Ultimate Edition, an advanced and industry leading system diagnostics and benchmarking solution which uses the award-winning Everest Technology. This diagnostics tool furnishes users with comprehensive and useful software, hardware and security information. It also offers comprehensive system benchmarking with real-time reporting. Users can use the application to monitor and troubleshoot if there is any error or problem arising during installation of new programs. The latest user-friendly Everest Ultimate Edition 5.02 has been released for users to try and costs a mere of $34.95 to buy. 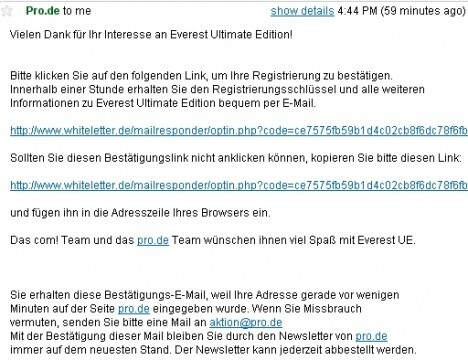 However, if users are not willing to spend money and are willing to compromise by using an older version, the good news is a German site is currently offering an older version, Everest Ultimate Edition 4.6 with license key for activation. 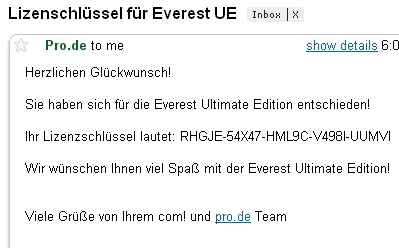 Users who want to grab this FREE Everest Ultimate Edition 4.6 can go to pro.de via the link here and fill in the information accordingly: Anrede (title), Herr (Mr.), Frau (Mrs.), Vorname (first name), Nachname (last name). Click “senden” to send. Users will thence receive an email from the promotional site. Users are required to click the confirmation link or alternately copy and paste the link into the browser for confirmation. Users will receive the validated registration key/license key for Everest Ultimate Edition 4.6 within an hour via email upon confirmation. Users can then download the Everest Ultimate Edition 4.6 via the link here. Users can key in the license key when they are prompted to do so.